How Much Exercise to Burn a Doughnut? Although doughnuts taste delicious, you may not want to indulge in the treat when you think about the time you need to spend in the gym to burn the calories off. Doughnuts contain anywhere from 175 to 550 calories per serving. This could mean hours in the gym depending on the intensity of your workout session. Instead of eating a doughnut, choose a healthier snack option that is lower in calories. According to the United States Department of Agriculture, one medium chocolate doughnut contains 175 calories. One medium plain doughnut covered with sugar or glaze has about 192 calories. If you participate in moderate forms of exercise, you will likely need about 30 minutes to work off the doughnut. According to Harvard Health Publications, if you weigh 155 lbs., you burn about 205 calories participating in 30 minutes of low-impact aerobics. Chain restaurants such as Dunkin Donuts and Krispy Kreme serve several types of doughnuts with a high number of calories. For instance, a Chocolate Coconut Cake Donut from Dunkin Donuts contains a whopping 550 calories. The Caramel Kreme Crunch Donut from Krispy Kreme has 390 calories. You'll need at least an hour of high-intensity exercise to burn off these high-calorie options. If you weigh 155 lbs., you must jog for an hour at 5 mph to burn a total of 596 calories. Your current weight and the intensity level of your workout affect how quickly you burn the calories. For instance, if you weigh 155 lbs., you burn 446 calories per hour swimming laps. Individuals who weigh 185 lbs. burn about 532 calories each hour of swimming. Instead of indulging and eating a doughnut, consider a lower-calorie alternative. For instance, a small bag of chocolate covered pretzels contains approximately 130 calories. You may also eat cookies or chips sold in 100 calorie snack packs. 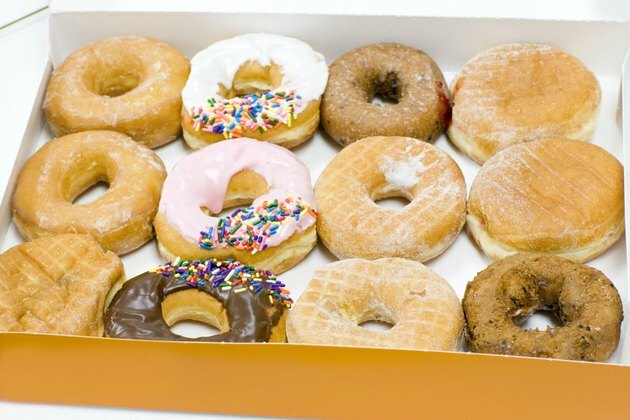 If you do find it hard to resist the pull of a doughnut, cut the doughnut in half or eat four doughnut holes or less.